Here at Nonprofit HR, we practice what we preach. We know that our company is only as strong as our staff, so we seek out and hire the best and brightest professionals in our industry. Why work for Nonprofit HR? We value creating an environment of innovation, empowerment, flexibility, authenticity, opportunity and community. As thought leaders in the HR space, our team of experts are called upon to be part of our clients’ solutions and have the opportunity to be creative with new HR challenges every day. There’s never a dull moment as we work with multiple clients of varying missions and sizes, each one with their own unique identity and needs. And our talent and HR business partners have the opportunity to get involved in business development, special projects and new initiatives in addition to projects and day-to-day HR work. We believe in giving our clients our best. We also believe that giving our best requires that we take care of ourselves and take time to balance or personal and professional lives. Because we operate from a results-oriented, trust-based environment, we empower our staff to manage their own schedules and enjoy unlimited paid time off. To us, doing our best work is all about maximizing the impact of the organizations we serve and supporting their communities and missions. Does Nonprofit HR sound like the organization you’ve been searching for? Do you have a deep desire to use your talents to make a difference for nonprofits and the people they serve? Are you an A-player who is excited to do something no organization has done before? If you’d like to be part of the only HR firm in the country that works exclusively with the nonprofit sector, browse our open positions below. Do you enjoy designing employee benefits packages that help social sector organizations attract and retain high-performing talent? If that’s a strong yes, then join Nonprofit HR as a Senior HR Business Partner/Benefits. In this role, you’ll work with our clients to develop creative total rewards solutions, design and administer competitive benefits packages, solve complex benefits-related challenges and provide tools to ensure high client engagement and retention. This role requires an eye for detail and being comfortable in client-facing roles. You should also be the discerning type and excel at technical activities like auditing benefits plans, analyzing data, and ensuring proper documentation. You also enjoy interacting with and supporting client employees as they discover and understand benefits programs. You are a leader and able to connect with employees at all levels. Simply put, a successful Senior HRBP/Benefits is technical and highly analytical but also personable and consultative. Nonprofit HR’s culture creates space for our employees to be extraordinary, authentic, and agile. Our team members are empowered to create and explore fearlessly and, most of all, to own what they do. Blended work experience with large groups (over 50) as well as small groups. DC Heathlink experience highly preferred. If you thrive in the employee benefits space, then apply for this unique opportunity. We welcome the resumes of individuals who are eager to contribute to a creative, entrepreneurial, and solutions-driven work environment! Read the full description here and see how to apply! Have you realized that HR is the career path for you and you’re ready to build and develop your skills in all functional HR areas? Are you up to the challenge of partnering with mission-driven organizations to bring their HR functions into the 21st century? Does a fast-paced, dynamic environment where no two days look the same excite you? If so, Nonprofit HR is looking for you! We are looking for high-performing HR Assistants for our fastest growing practice area, Virtual HR Outsourcing (vHRO). Different from traditional consulting, vHRO uses a virtual model that allows us to partner with small nonprofits that have great missions but don’t have all the resources they need to advance their work. Working on the vHRO team provides our HR Assistants the opportunity to work with and learn from a team of skilled HR Business Partners to support creative and best practice solutions to meet our clients HR needs. As an HR Assistant, you’ll support our clients’ operational and tactical needs around: benefits, compliance, culture, employee relations, onboarding & orientation, performance management, talent acquisition and training & development under the direction of an HR Business Partner. If you have at least one (1) year of experience in an entry level HR position and a passion to learn more and advance your career in all functional areas of HR, we should talk. You should have a basic understanding of human resources principles and practices. The ability to meet multiple deadlines and handle multiple assignments simultaneously by utilizing your organizational and time management skills should be second nature. If you have a strong client service orientation, commitment to excellence, are highly self-motivated and comfortable interacting with a wide variety of audiences including management, staff and other potential client stakeholders, this could be a great opportunity for you. You must be able to work effectively with a team. Your comfort level with the Microsoft Office suite should be strong and experience utilizing an HRIS is helpful. Having the ability to work confidently and proactively in a dynamic, fast-paced environment will get you noticed. If you’re looking for a creative, solutions-driven work environment where you can make a living and a difference, we’d love to hear from you! Nonprofit HR also offers an exceptional benefits plan that includes; unlimited leave, medical and dental, a generous holiday schedule, a 401k match program and the opportunity to chart your own professional course! Do you absolutely love HR and working with organizations to achieve their mission through their people? 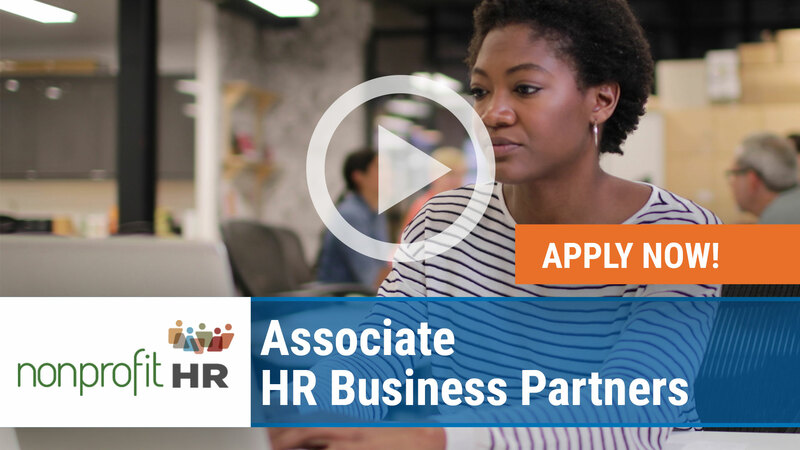 Join Nonprofit HR, and work on-site with our clients on a wide array of administrative and operational HR projects and tasks across the HR lifecycle including talent acquisition, onboarding, benefits, performance management, employee relations, talent management, compliance, staff training, etc. The Associate HRBP works under the general direction of a Senior HRBP and a client liaison to ensure high quality client service and support. This is a dynamic opportunity for an individual who is interested in growing his/her career in the field of HR. We welcome the resumes of individuals who are looking for a creative, solutions-driven work environment. To be considered for this full-time opportunity, please submit your resume and cover letter with the subject line, “Associate HRBP” to us at careers@nonprofithr.com. Are you an HR professional who wants to make a difference in the nonprofit sector and have an impact on multiple missions? Are you up to the challenge of partnering with mission-driven organizations to bring their HR functions into the 21st century? Are you ready for your advice and guidance to be sought after and valued? If so, Nonprofit HR is looking for you! We are looking for high-performing HR Business Partners (HRBPs) for our fast-growing Outsourcing practice. Our Outsourcing practice partners with small and mid-size nonprofits that have great missions but don’t have all the resources they need to advance their work. As an HRBP, you’ll manage a portfolio of multiple clients and support both their strategic and operational needs around benefits, compliance, culture, employee relations, leadership support, onboarding & orientation, performance management, talent acquisition and training & development. You’ll also have a community of colleagues to collaborate with, but will work mostly independently to ensure high-quality client service and culture. If you have five (5) or more years of experience as a generalist and deep technical experience in all functional areas of HR, we should talk. Having an HR certification is a bonus. You should be analytical and able to look broadly at business practices to identify critical HR/talent implications. If you have a strong client service orientation, commitment to excellence, are highly self-motivated and comfortable interacting with a wide variety of audiences including management, staff, boards of directors and other potential client stakeholders, this could be a great opportunity for you. You must be able to work effectively alone and with a team. Your technology skills should speak for themselves and having an entrepreneurial orientation doesn’t hurt either. Having the ability to work confidently and independently in a dynamic, fast-paced environment will get you noticed. Nonprofit HR also offers an exceptional benefits plan that includes: unlimited leave, medical and dental, a generous holiday schedule, a 401k match program and the opportunity to chart your own professional course! Don’t see a position that is a fit but still want to work with us? We’re always looking for talented professionals to add to our team, even when we don’t have positions listed. Please email your resumé and cover letter to careers@nonprofithr.com. “Whenever I am asked about my job, people can tell how much I enjoy it. It is fabulous to be able to work in a role where I know that my contributions are helping nonprofits achieve their remarkable missions. Working with a wide variety of clients provides me with the opportunity to deal with all kinds of HR and talent issues. An equal opportunity employer, Nonprofit HR offers a dynamic, collegial and entrepreneurial work environment and is centrally located at the McPherson Square Metro stop in downtown Washington, D.C.